This year I went a little bit crazy buying tomato plants. Over the past few years I’ve tried planting eggplants and I’ve tried zucchini and cucumbers…but always had a measly return for my efforts making me feel like a green failure. 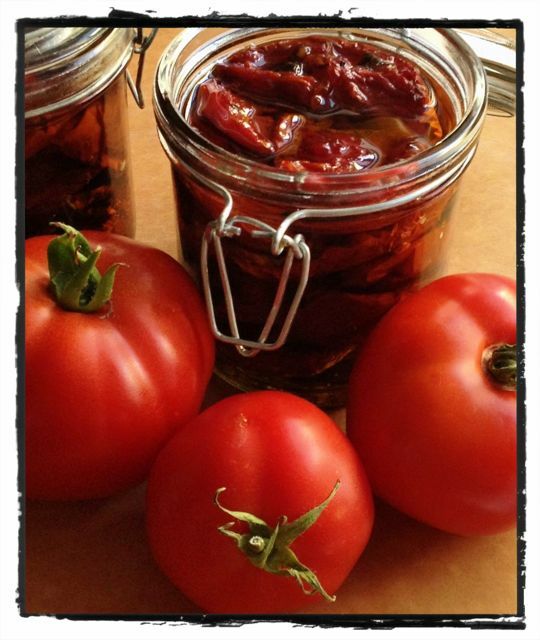 Tomatoes on the other hand, grow like a weed and produce exceptional fruit! So this year, I filled every bit of soil with Early Girl tomato plants and a couple of cherry tomato plants. And now…a few months later, I have tomatoes coming out of my ears, and have been trying out numerous recipes to use them. So far I’ve canned whole tomatoes and tomato sauce. I’ve tried tomato jam with great results. And of course I’ve had hobz biz-zejt u t-tadam (bread with tomatoes and olive oil)…which is my ultimate favourite summer food!! 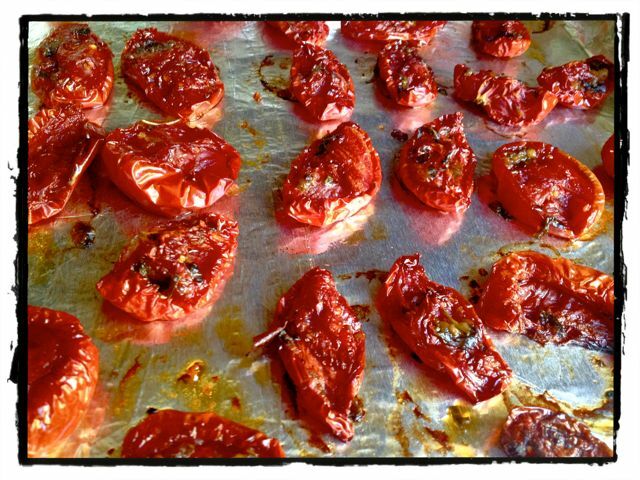 Then last week, my friend Terrie whom I have known since our school days, posted photos of her oven dried tomatoes and I could not stop drooling!! So here it is…all the way from Holland…Terrie’s Oven Dried Tomato recipe. You get the picture…so I’m going to try my best and give you the quantities, but please feel free to add or omit and adjust to your heart’s content. 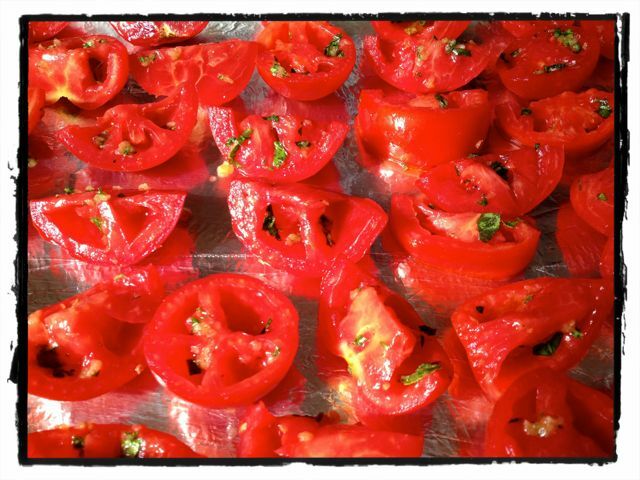 Cut the tomatoes in half and deseed. Sprinkle some salt on each half and place them face down on paper towels in a dish and leave them there for about half an hour to absorb some of the juices. In the meantime, mince the garlic and place in a small bowl along with the rest of the chopped up herbs and salt and pepper. Quarter the tomatoes and brush them with oil mixture. Place in a prepared dish about half an inch apart. Sprinkle some salt and pepper. Bake in 250 degree oven for about 3-4 hours depending on your oven. Mine took longer so keep checking them until they’re done. 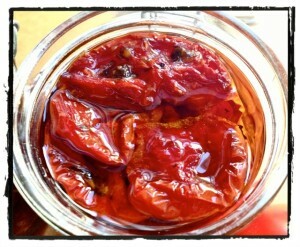 Let cool and place in sterilised jar. Pour enough olive oil to cover the tomatoes. Store in refrigerator.